Last week was possibly one of the most exciting weeks I’ve had in Sydney! It was an action packed week thanks to Boohoo.com. Last Wednesday was the launch of the new Boohoo winter collection and luckily enough it was right on my doorstep at Bondi Beach! It was lovely catching up with fellow bloggers Gabby and Alisha over mulled wine and ice-skating! It didn’t seem quite right experiencing a ‘christmassy’ activity in 20 degree weather and spent the night pondering how the outdoor rink was not melting already. #experienceeverything is a global competition that Boohoo are running on Instagram to get followers involved in capturing their exciting moments. Alisha had two tickets to go glamping last Thursday and guess who her plus one was?.......me! So we headed by ferry to Cockatoo Island and spent most of our time shooting some looks with the breathtaking sunset. I’ve honestly never seen a sky so beautiful and definitely will be heading back soon! Did I mention we were the only ones on the entire island? Scary and exciting all in the same breath. Waking up to the most glorious sunrise, it was time to head out to my trapeze class that Boohoo arranged for me. AMAZING! 2 hours of flying through the sky being caught in the arms of a shirtless hottie made my experience that bit more fun! 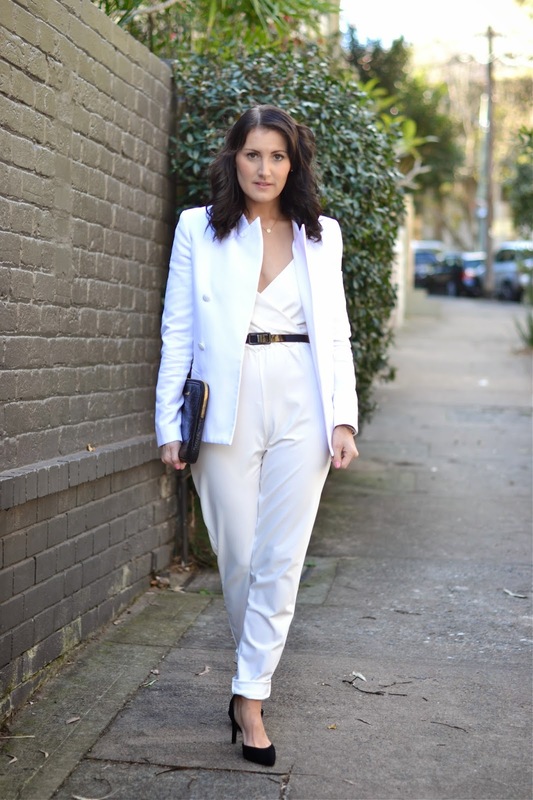 Silly me thought that this white jumpsuit would have been suitable for circus school! Obviously decided against that and shot this look with Andrea in Paddington. As mentioned in a previous post, my biggest obsession this year is all white. Even though it is winter here, I just can’t get enough of this crisp clean look and can’t wait to see how Australia will approach this trend for spring/summer. I'm also loving my new hair products from Goldwell Australia which added body and shine to this look. Hope you’ve all had an awesome week and would love to know what your plans are!